The Binding Of Isaac: Afterbirth, the massive add-on expansion for The Binding Of Isaac: Rebirth, will finally be released on Xbox One and PlayStation 4 next month, developer Nicalis has announced. The DLC released on PC back in October of last year, and while the console version was set to appear by the end of 2015, it has been hit by several delays, presumably to standardize a release date across all platforms. While the game will also release on Nintendo’s Wii U, Nicalis is still unsure on whether Afterbirth will meet the same release date as Microsoft and Sony’s consoles. Rebirth itself is already a huge game, but Nicalis says that Afterbirth adds over 100 hours of additional gameplay, as well as hundreds of new items, bosses and the addition of daily runs that give the player a specific set of items. Daily Runs – play a new official run, everyday! 10 totally new and awesome challenges! MONSTROUSLY UPDATED WEAPON COMBO SYSTEM! 120 new items–not counting tons of new pickups, chests, pills, bombs and cards–taking the item count up beyond 500! The Binding Of Isaac: Afterbirth will launch for Xbox One and PlayStation 4 on May 10 for $10.99. 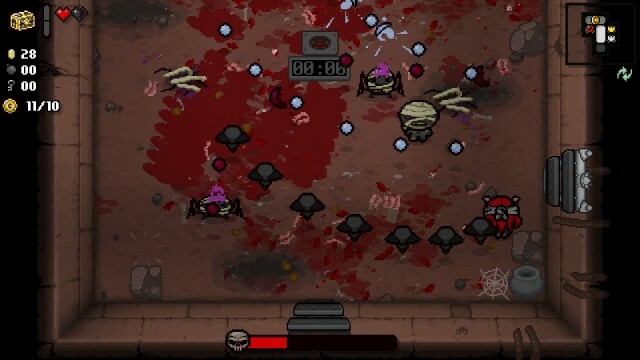 Series creator Edmund McMillen has recently been asking fans for suggestions on an upcoming update for the Steam version of the game, Afterbirth+, which aims to add even more items, bosses and characters, as well as modding tools for the community to make their own, custom challenges.